Retargeting Facebook Ads are incredibly important these days! Website visitors abandon the sales funnel for many reasons… they’re unsure, they need permission, they don’t have their credit card handy, their 2-year-old jumps in their lap, and so on. But don’t worry, your sale isn’t necessarily lost. 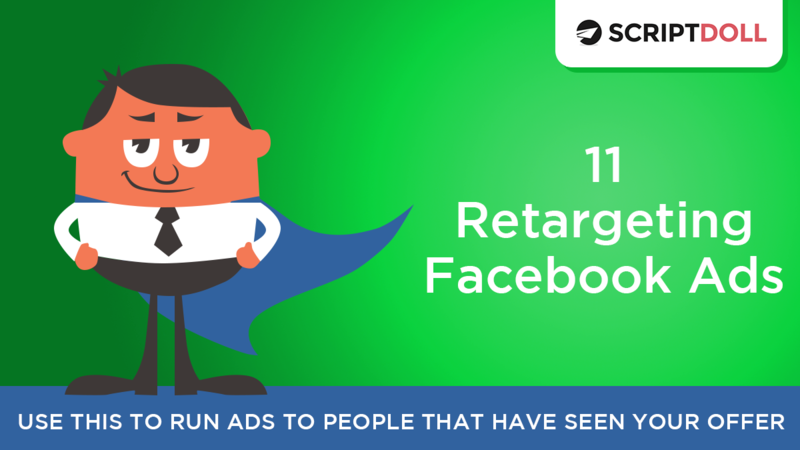 Want access to the 11 Retargeting Facebook Ads script and all the others inside ScriptDoll? Hey, guys! Monica here from ScriptDoll. I am super super super excited to bring you the newest script! It is the 11 Retargeting Facebook Ads script. Now, you know we already have our 10 Facebook Ads, and they are working amazingly for everyone, but retargeting Facebook ads are a little bit different. So I wanted to create a script for you guys that would let you do that. [00:00:30] Now, they say you never get a second chance to make a first impression. Well, that may be true and you may not get another first impression, but with retargeting, you can get a second, a third, a fifth, a hundredth impression if you want. And you know you need them because website visitors abandon your sales funnel for a lot of reasons: they’re not sure about the product, they need to think about it, they need to get their spouse’s permission, they don’t have their credit card handy, they’re 2 year old jumps in their lap, and yada yada yada. [00:01:00] There’s always something going on in someone’s life that prevents them from actually checking out, so you’re going to want to reengage them so that you get that sale back because this prospect isn’t lost. They just need you to remind them to get your product. So that’s where retargeting comes in. I’m going to go ahead and generate this script using our Puppy Training template. All right, so we’ve got the 11 Retargeting Facebook Ads script generated and you guys, this is for warm traffic. You’re going to want to only use this to retarget people because of the way that these are set up. [00:01:30] So there’s some tips for success and a little breakdown of Facebook ads, and then we jump right into the ads. So this first ad is really important because it gives you a little bit of social proof, right? Insert the number of buyers. So if you’ve got ten people that have already bought or a hundred people or ten thousand people, put that number in there. And then there’s things from your profile to flush out this ad. [00:02:30] Remember, you need to edit these a little bit for grammar and stuff after you have generated the 11 Retargeting Facebook Ads script because sometimes the way you put stuff into your profile doesn’t exactly match up with the script grammar. No big deal, just go ahead and edit it. Retargeting ad number 3 is going to alleviate some of their worries by letting them know about the guarantee that you’re offering. If you’ve got a better guarantee, then please put it in here. It also adds a little scarcity down here in the caption. [00:03:30] And this testimonial actually wouldn’t work. You’re going to want something more specific, like “Oh my gosh, I followed this guide and in two weeks, my puppy stopped chewing my designer shoes! Thank you!” And you just want more of a case study appeal to this because that gives them also social proof that it could work. You’re going to want the image of the person that is in the ad, and then for the headline, you want to say, “Try the (product name) yourself! If it doesn’t work for you, don’t worry, you’re protected by our lifetime money-back guarantee” … Whatever your guarantee is. Again, you’re alleviating concerns with these retargeting ads. In case they had some concerns … It could have just been distracted and they’ll buy again, but we want to make sure to alleviate concerns as well. [00:04:00] So on the retargeting ad number 5, this is a classic discount, right? Ten percent off extra, insert a coupon code. There is nothing that is rocket science about this. You guys probably see this all the time in your own Facebook ad feed, so there’s that one. [00:05:00] Retargeting ad number 7 is getting it in front of them again, right? So “chew train a rambunctious six-month old puppy.” Just reminding them of the main thing that they want to do. Get the Puppy Training Guide and hurry because we’ll only be selling ten copies! There’s that scarcity again and that urgency. Facebook Ad number 8 is along those same lines. We’re really playing into the urgency and the scarcity. You guys don’t have to use all of these ads, you pick the one that resonates the most with you that you think will resonate the most with your audience, and then always A/B test them. You can still test these, they’re great for that. And that’s why we have 11 of them because we understand that not everybody is going to have the same scenario. [00:05:30] Retargeting ad number 9, again, is saying, “Hey, is this not working? You really need to try our product.” Just getting those benefits and features in front of them again and adding a little scarcity. [00:06:00] Retargeting ad number 10 is more of the social proof. So we’ve got the testimonials in there, 123, and it’s really, oh, it answers that question in their mind like, “Is this actually really going to work for me?” Well, it’s worked for these other people, so yes. Again, we add scarcity in the caption and this try it risk-fee with our life … Risk-free with out lifetime money-back guarantee. Also, you guys, feel free to mix and match the top copy and the headlines. They are put together strategically for you to get great results, but your audience is different and you guys do what you think is best and then test. [00:06:30] The last retargeting ad is more of a story, right? Like you want them to envision their life and have more of a camaraderie with them. So that’s what this is, basically people telling them that they can’t, right? This has happened to all of us at some point, and so that’s what this plays on, that emotion, and then we also add the scarcity. [00:07:00] So go ahead and get all these, and then I just wanted to show you real fast how this works from a setup point of view. So since we’re talking about Facebook, we’re specifically talking about Facebook pixels. So there’s this website, https://www.facebook.com/business/a/online-sales/custom-audiences-website. That’s a lot, I’ll put the link for you down below, but you’re going to want to build custom audiences from your website using the Facebook pixel. So this tells you how to install your Facebook pixel, how to create it from Facebook, and then how to install it. You probably need to read more to actually do that and then place the code on your webpages. And then you’re going to want to create an audience, and I’m going to go through and show you how to do that real fast and how to create an ad. [00:08:00] So, over here in my ad manager, which again, it’s on business.facebook.com, you can actually just go to that site and it will let you create an ad. I’ve just started to create an ad and I’m going to choose traffic as my objective, just for this example, and then I am going to go ahead and wait for it to load. So, I’ve already got my pixel installed. So where do I want to send the traffic? I want to send it to a website, and down here under audience, I’m going to create a new audience and I’m going to click this ‘create new button’ and I’m going to create custom audience. And you can see I have this website traffic option. You can also use engagement because that means that they’re warm traffic as well. [00:08:30] I’m going to go ahead and click ‘website traffic’. Now, see it’s using my ScriptDoll pixel and I can pick all my website visitors up in the past seven days. You guys, the more traffic that you have, the better, so you can do seven days, you can do thirty days. [00:09:00] You can also, say people who have only visited specific pages, which is pretty cool, so if you just have a sales page that you want, then you could say, hey, just this page. And then the URL contains, or doesn’t contain, or equals, and you can say by how much time they spent. Right? [00:09:30] So I’m going to create this audience. And then you guys can use this audience over and over and over. They say, “Hey, it’ll take a few minutes.” No big deal, just click ‘done’. Your estimates are just going to be unavailable for a little bit. So then you can go ahead and add more targeting if you want. I’m actually going to remove the United States targeting. And go ahead and continue on. You can add connection times, whatever, and then you have this up here, so you’re good to go. And you can continue on creating your ad. [00:10:00] So I’m just going to show you a few things. First of all, we always are committing to start your ads at five dollars a day because it will give us some time to warm up and really get Facebook to see who’s converting and clicking your links. So we’re going to optimize for link clicks, which is fine, and Facebook really does a good job of delivering what you ask for. So if you want link clicks, then say link clicks, because they’ll do that. [00:10:30] If you continue, you can create a new ad. I’m going to go ahead and create a new ad from ScriptDoll. We have lots of pages. So in these, you can do a single ad, a slideshow, a collection … I’m just going to do a single image. And let’s see. So I’m going to go back to my ads here. Let’s do retargeting ad number 10. Okay, so I am going to actually browse my library of images because I have this fabulous beautiful woman here, we’re going to pretend that she is one of our users, just for the demo. Go ahead and click ‘done’. [00:11:00] And then, you want a destination of where it’s going to be, you can put that in. Put in whatever your sales page is, so we can do, this is our main sales page, http://get.scriptdoll.com/trialoffer. It’s going to preload this, and that’s fine. But we’re going to write over it. [00:11:30] So we’re going to copy this headline and we’re going to paste it and then we’re going to come back in here and we’re going to paste this caption over the text. [00:12:00] So you can see, it’s starting to build this ad over here. Nope, I put that in the wrong spot. So this goes here, the news feed link description. And then … So we’re looking at it on mobile, it doesn’t have it on mobile. So let’s go ahead and look at the desktop news feed. So see how it came in down here? And then the top copy … Let’s copy … We only get to copy one line at a time because of the way ScriptDoll is built. So go ahead and copy this. If you had downloaded this, obviously, you can copy it all. And you can just use one testimonial, if that’s what you have. You can use two or three. If these are really long and detailed, I would actually put them more in a case study format. So go ahead and copy this one, last one. And then, you can see what this ad looks like over here. [00:12:30] So you can see where you put the different things in. The headline, the text, and then the call to action. If this is a retarget, I might do sign up or shop now, just because they’ve already seen your product. So you want to make sure you’re using the right pixel if you’ve got multiple ones, and then you can go ahead and review your order and place it. So I’m not going to do that because this is obviously a puppy chew training guide ad on my ScriptDoll page. But you guys get the idea of how to create this. [00:13:00] So that is how you’re going to use this Retargeting Facebook Ads script, and I would love to hear how it’s going for you. Leave a comment below and tell me. Use these to really drive up your conversions and get those people back and get them to push the ‘buy’ button and actually enter their credit card so that you can keep doing business and helping all the people that you help. [00:13:30] Thank you so much! If you’re a ScriptDoll user, the 11 Retargeting Facebook Ads script is in the ads section of your scripts, over here, right here in ads. And if you are not a ScriptDoll user, then you can sign up for our trial. The details are below.